Lily Branson surrounded by the “children” to whom she was once “nanny”, on the occasion of her 100th birthday party. The funeral of former Sulgrave resident Lily Branson took place at Marlborough Road Methodist Church, Banbury, on 26th June 2012. Lily was born on 25th January 1908 to the Clifton family in Portsmouth where her father was on the staff of the harbour master after retiring from the Royal Navy as a Petty Officer (he had served on sailing ships at the start of his career). She died in Banbury on 9th June 2012. After many years as a “nanny” with families both in Sulgrave and elsewhere, in 1951 she married Tom Branson from the village and settled in Helmdon Road. She and Tom moved to Banbury in 1966, where he died in 1979. During her 33 years as a widow she was an active churchgoer and made many friends in Banbury. The funeral service closed with a wonderfully rousing singing of “The Lord’s my shepherd…” to Crimond, just as she would have wished. 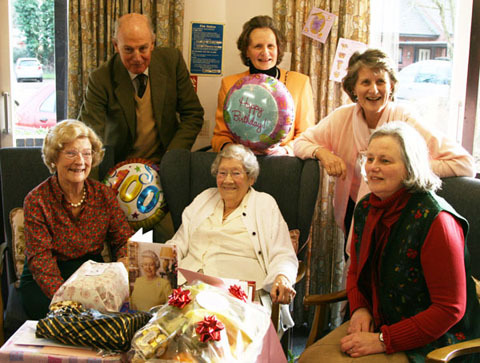 See here for more photographs from her 100th birthday party. This entry was posted on Tuesday, July 3rd, 2012 at 12:03 pm	and is filed under News. You can follow any responses to this entry through the RSS 2.0 feed. You can leave a response, or trackback from your own site.